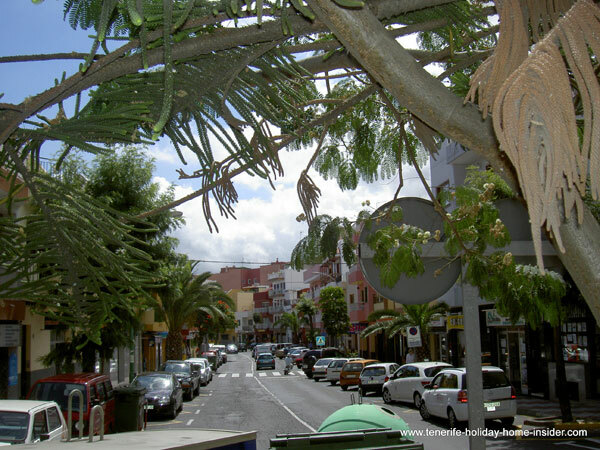 Seeing to believe Tenerife fishing spots . Fishing spots are in most amazing places. Every country cherishes its own. Tenerife island only has them by the ocean or on high seas. 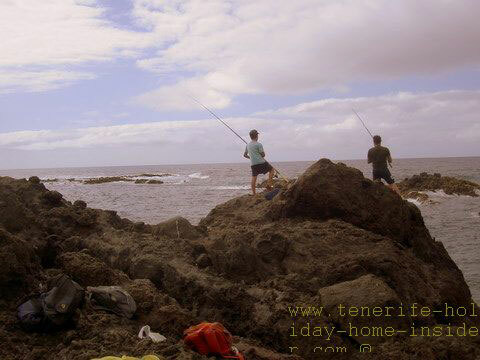 Tenerife fishing, such as depicted here at El Guindaste by Rambla del Mar of Puerto de la Cruz by the town next to Puerto Cruz is not only part of the island's culture. Fishermen have passed on their favorite locations to catch the fish to quite a few generations as a means to feed a family, as a pastime, as a challenge and even as a sport. 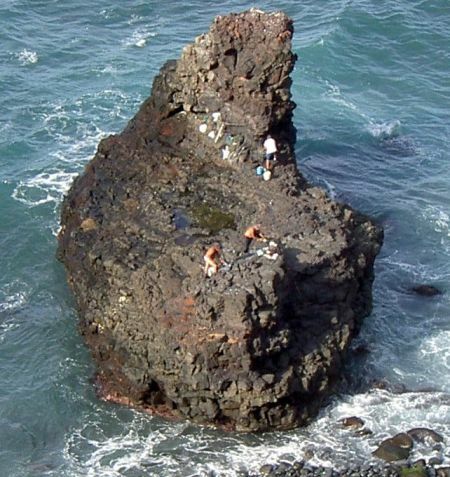 Most areas to stand on for fishing are on top of volcanic rocks on the biggest of all Canary Islands. Those cliffs are not comfortable for your feet and unpleasant to sit on, by the way. Discover the cliff pebble beach Playa de Los roques just below the Maritim Hotel... Wonder how on earth people are able to climb those rocks or how they get down from them back to shore. You may not believe this but, when I first saw those fishing places, I was wondering if helicopters had dropped the fishermen on top. Look at the isolated rock... It is circled by so much water off the shore below the Hotel Maritim. . This roundish cliff which rises out from the sea looks like 20m high by twelve meters in diameter. The fishing guys resemble ants which crawl on its rustic terrain. What fly fishing locations for a fishing venture! Make out their buckets and clothes here and there which dot up the pitch black rock. By the way, it takes some cumbersome walking to get down to those fishing spots on the round pointy rock. Also, it helps that all who want to fish can leave cars not far away outside the skyrise hotel. Dangerous fishing rocks in Tenerife. Wonder about the other fishing locations which are on a more elongated rock. My hair wants to raise when I see the men fishing on top. Truly, this is one of adventure sports which may seldom come in a better wrapping. This may also be a form of great fishing holidays for those who know these spots. What could be better to be away from tourists and all other crowds? To be one with the blue yonder of an ocean all around. Wouldn't it strike you as bliss to be kissed by the purest air with only the sound of the waves as music in your ears? Then there is the silent companionship of others who have elected those fishing rocks. More prime Tenerife fishing spots? San Telmo beach in middle of El Puerto Cruz. Plaza Europa near Martianez pools. End of July 2011, I made out at least 5 fly fishing men by the gutted saltwater swimming pool next to tunnel right by the coastal road below the Seminar Hotel Semiramis near Beach Playa Martianez. Otherwise, no fishing spot by the Martianez beach but by the jetty of the Puerto garden beach, a plan of which sea here where Fort Castillo San Felip as well as its Muelle quay is depicted with all its beaches. Near Muelle Puerto de la Cruz for shark catching. On high seas with fishing boats off beach el Arenal Tenerife. Off el Puertito Adeje coast and Puerto Colon. Punta del Fraile, Teno Tenerife 9 million year old terrain. Fishing spots by Buenavista North or Los Silos towns Isla Baja Tenerife. 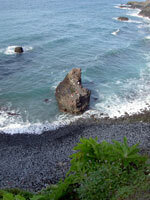 By all Tenerife nature pools by the seashores. Back from fishing spots to fishing vacations where Island El Hierro is mentioned as good spot to catch fish and more.